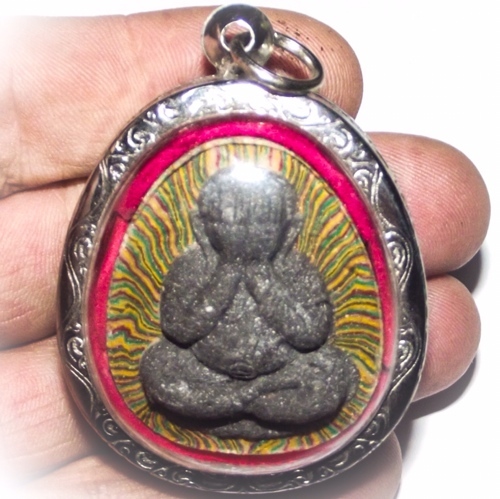 Pra Pid Ta jumbo size sacred powder amulet from one of this Century’s most highly acclaimed guru masters of Sacred Buddhist Amulet making, and one of the most highly reverent and respected monks in living memory, Luang Por Pae, of Wat Pikul Tong (Singhburi). 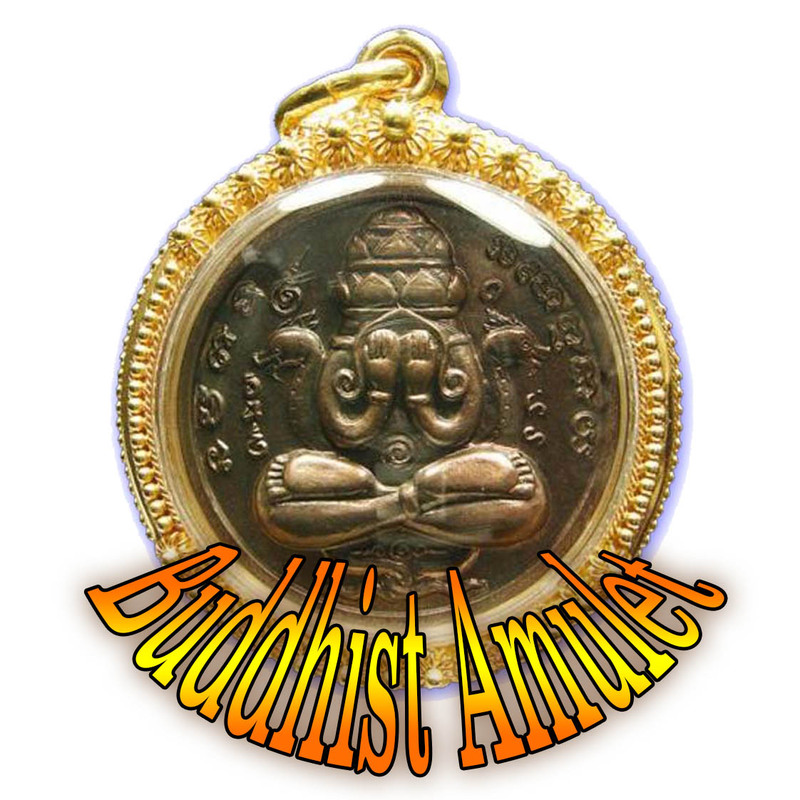 This particular Amulet, is in super jumbo size, and is one of his most famous all-time classics and is especially sought after, for its individuality. 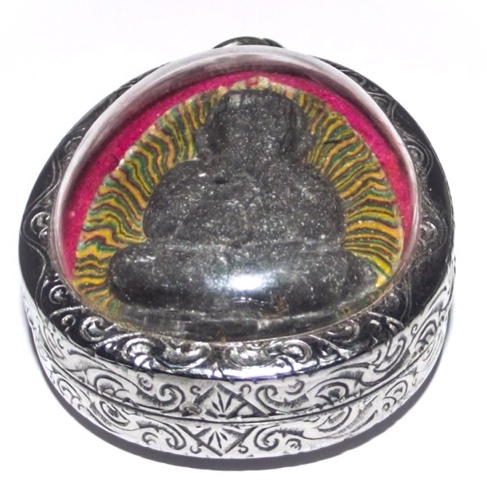 This is largely due to the rainbow coloured sacred powders used for its making, we to lend it a very attractive visual appearance. 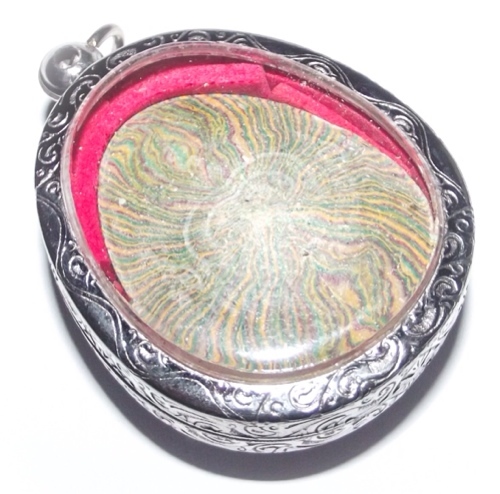 Rainbow coloured sacred powder Amulets are most famous because of two famous masters one of them being Luang Por Pae, and the other of course, being Luang Por Koon of Wat Ban Rai in Nakorn Ratchasima. 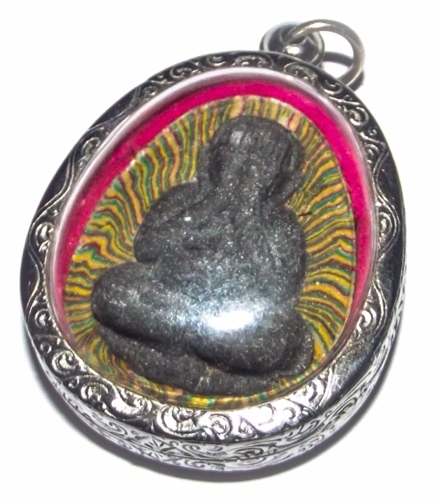 The amulet measures 5×4 cm, and bears an image of a border with his hands of his eyes which represents about entering the meditative state of Nirodha. This position when drawn in sacred geometry, is known as ‘Pra Putta Jao Ham Tugkh’, which means, the Lord Buddha for bidding suffering. This refers to The practice of a Buddha entering the state of Nirodha, which is a meditative state, where are no suffering can exist within the mind. This state is attained by the closing off of all attachments to a exterior phenomena, and this is represented with the closing of the eyes and in some cases with some Buddha images also the closing of all orifices in the human body. 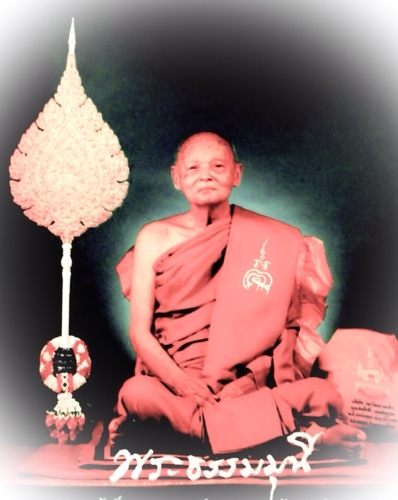 Pra Pid Ta Sai Rung Luang Por Pae Wat Pikul Tong, is now even rarer than the Pra Somdej Sai Rung, and is since some time an accepted competition class amulet which is showable in prize giving competitions and amulet conventions. 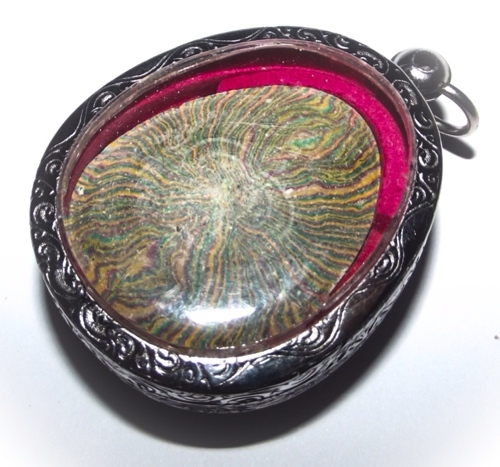 During the last few years, the rainbow coloured sacred powder Amulets and Pra Somdej classics of this great master, have been seen to dwindle from the public amulet markets, which is due to the fact that not only Thai people have been reverie and holding his Amulets over the last decade or so up, rather that all around Southeast Asia and even as far as western world, people have been snapping up and hiding and stashing away his Amulets like treasure that may never be found again, which is indeed going to be true pretty soon. This edition was made in Jumbo and ‘Plod Nee’ models, the plod nee being slightly smaller and more tapered on the top edge than the jumbo version, but both were released in large sizes. Plod Nee Pra Pid Ta are usually made in a smaller size, which is fitting for ladies and children, but in this particular series they were made in jumbo size in both types. 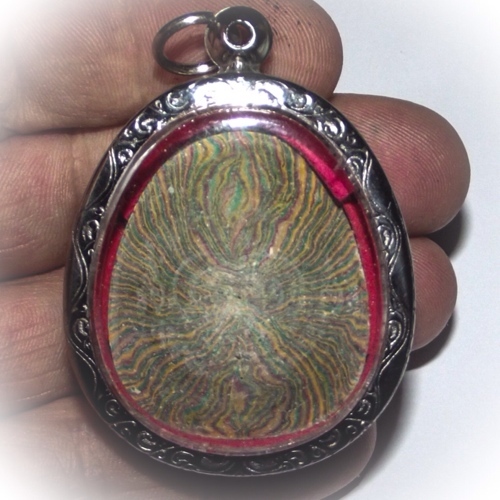 This has resulted in an accelerated depletion of his Amulets, despite the fact that classic Amulets made according to the official formlas such as the Pra Somdej amulet, are making numbers of up to 84,000 per addition they have still managed to begin to disappear from the public view. They are now not only becoming classics but also extreme rarities and the next decade can expect to see these Amulets becoming immensely difficult to seek out. 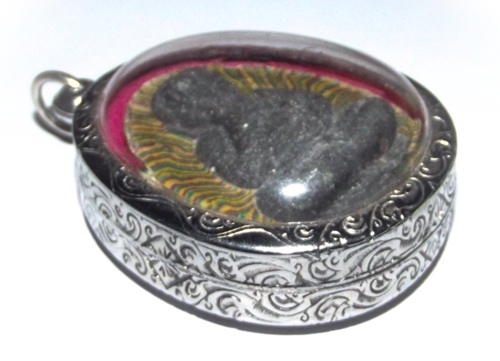 Origins of the Pra Pid Ta amulet.